San Jose police arrested a suspected gunman Thursday morning who allegedly tried to rob a check-cashing facility and then ran away by jumping from rooftop to rooftop in the eastern part of the city. The arrest of the man in his 20s came at about 10:30 a.m., a little more than two hours after police began to pursue him. His identity was not immediately disclosed and how the standoff ended wasn't made clear. The suspect was taken by ambulance to a hospital to be treated for unknown injuries. Police also confirmed he acted alone and they were not seeking anyone else. By 11:30 a.m., police had found the man's gun, and opened the neighborhood back to residents who live on Cinderella Lane. The arrest capped a tense morning. Sgt. Jason Dwyer said the suspect tried to rob a check-cashing center just before 8 a.m. in the 2100 block of Story Road. Witnesses reported that shots were fired, though no one was injured. A tripped alarm triggered a 911 call. The man ran away, prompting a police chase that led to the intersection of Cinderella Lane and Sunset Avenue. Police blocked off streets in the area. A homeowner in the neighborhood told NBC Bay Area that the suspect entered his home. "Get out!" Chito Espejo said he shouted at the suspect, who said "OK," and scrambled up onto the roof. Espejo said he didn't see a gun, but saw the suspect jumping from roof to roof. By 8:30 a.m., the neighborhood was swarming with officers, poised with guns drawn, as residents waited nervously outside their homes. Police checked the trunks of cars as residents left for work. SJPD's specialized MERGE unit was on hand to help flush out the suspect. NBC Bay Area's Bob Redell posted the video below to Vine. 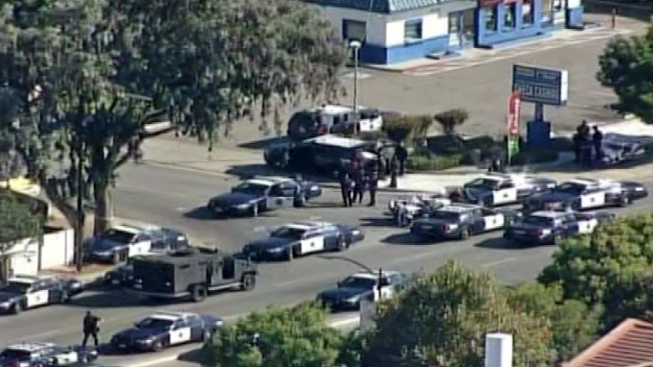 It shows San Jose police waiting out the suspected gunman on Cinderella Way.